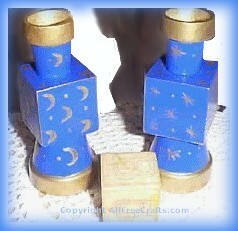 Revamp old wooden alphabet blocks to make yourself some celestial moon-and-stars candle holders. 1. Smooth the alphabet sides of the wooden blocks by applying grout or spackling compound to fill in the spaces around the letters. You will only have to fill in two sides on each block. Let dry and lightly sand until smooth. 2. Glue the pieces of the candle holders together, following the sample shown in the photo. Place the wooden pot on top, the alphabet block in the middle, and the clay pot upside down on the bottom. 3. Paint all parts of the candle holder in the color of your choice, except the rim of the wooden pot and the rim of the clay pot. Paint the pot rims in metallic gold. 4. Following the photo, paint five moon shapes and four dots on each side of one wooden block. Paint a moon on the four sections of both pots that face a flat side on the block. With the flat side of the paint brush lightly loaded with gold paint, go around the edges of the block to create a small line of gold trim. Follow the same procedure for the second candle holder, replacing the moon shape with stars. 5. Buy a candle to fit the candle holder to make a great homemade gift for someone special, including you!